Shane Farren was in excellent form for Banagher. 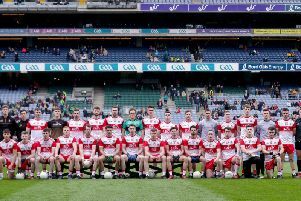 Banagher may have caused a championship upset with this commanding seven point win over favourites Kilrea but it was a victory that was richly deserved as they were the more composed and clinical side from the start. There was little between the sides in the opening half, Banagher going into the break 0-10 to 1-6 ahead, the Pearses hitting three dreadful wides in the closing minutes of the half. Mark Lynch scored a brace of points in the early minutes, the outstanding Ryan McGillion and Shane Farren on target as Banagher led 0-4 to 0-1 after six minutes. Two minutes later Stephen Johnston bulged the net to put Kilrea ahead but from that to the break Banagher dominated midfield and picked off some excellent points to stay in front, Eunan Murphy pointing twice, Enda McAleese and Denver Johnston cutting the Banagher lead before the short whistle. Twelve minutes into the second half substitute Niall Johnston levelled the score at 0-13 to 1-10 but that was as good as it got for Kilrea as Ryan McGillian and Peter Hagan netted in the 43rd and 45th minute to end the game as a contest. Four minutes from time Steafan McCloskey scored the third Banagher goal, Brian Óg McAlary getting a consolation major in the final minute. St Mary’s go forward to a intriguing looking quarter-final now against Ballinderry Shamrocks. These sides were locked at 0-5 each at the end of a keenly contested first half at Owenbeg on Sunday night before a massive crown of 3,500 enthralled spectators. The sides were level on three occasions before Raymond Wilkinson scored his third point of the half and Dominic McFaul pointed in the one minute of added time to send the sides in all square at the break. Eoghan Brown (2), Ciaran Byrne and Dermot Larkin were the other Bellaghy scorers, Michael McIver and Ryan Bell on target for the Shamrocks. Mark McCleneghan made a point blank save to deny Conleith Gilligan a goal a minute into the second half, Frankie Donnelly (2) and Sean Cassidy on target as the Tones opened a three point gap. Points from Wilkinson, Ciaran Byrne from a free and Ryan Bell left the score 0-9 to 0-7 in the 42nd minute. Midway through the half came the decisive score when a patient build up involving Enda Muldoon and Ryan Bell paved the way for Ballinderry full-back Ryan Scott to ghost in and take the final pass before slamming the ball to the net for 1-7 to 0-9. Kevin Doherty did level the scores but a misdirected free out of the Bellaghy defence gifted Conleith Gilligan a point, Raymond Wilkinson then landing his fifth point from play to put Ballinderry into a quarter final meeting with Banagher.